The successful defence of Romani (35km east of the Suez Canal) in August 1916 was the first large-scale victory for the Light Horse in World War 1 – but among the casualties was Trooper Douglas Dunmore Campbell of B Squadron, 2nd Australian Light Horse Regiment, 1st Light Horse Brigade. We don’t know exactly when he fell, but it must have been between 1 and 6 am on the morning of 4 August 1916. On the night of 3 August large Turkish forces outflanked prepared infantry positions, intending to come in on those defences from their rear, but instead encountered a line of observation posts to which the 1st Light Horse Brigade (including the 2nd Light Horse Regiment) had been deployed just before dusk that day. The posts were not entrenched and the ‘line’ was thin – B Squadron of the 2nd Light Horse Regiment in which Douglas Campbell served, was no more than 100 men spread over 2,000 yards of dunes and gullies. The Turks began to probe and by 1am in the morning of 4 August B Squadron reported that they were being attacked in strength. They were sent additional ammunition and told to hold on at all costs. The communication line back to Brigade headquarters was broken and in volume vii of the Official History Gullett comments that ‘from then to dawn the resistance depended upon the wits of squadron and troop leaders and the resource and resolution of the men’. At 2.40am B Squadron was one of the units ‘having very lively fighting’ according to the Regimental history. Shortly after that, given the size of the attacking force, the defenders were forced to hurriedly fall back in stages to a pre-selected line - which with the help of some reinforcements was held until daylight. The Regimental history was justified in concluding that ‘We had the satisfaction of knowing that our strenuous night’s fighting, by forcing the enemy to deploy before he intended, upset his plans and was a big factor in the subsequent victory’. Douglas Campbell was buried at Etmaler, Romani with Chaplain HK Gordon present. His remains were later re-interred at the Kantara War Memorial Cemetery (Ref B.63). Douglas Dunmore Campbell was born in the suburb of New Farm, Brisbane to John Dunmore Campbell and his Irish-born wife Mary (‘Minnie’) nee Cameron. Douglas’ father worked in the family firm – James Campbell and Sons - and from 1896 was chairman and managing director. After serving in local government, JD Campbell held the seat of Moreton in the Queensland Legislative Assembly for 10 years, and was briefly minister for railways 1907-08. Outside of politics he was associated with many organisations such as the Marine Board of Queensland, the Queensland Employers Federation, the Brisbane Hospital Committee of Management and the Queensland Rugby Union. The family firm had been established by Douglas’ paternal grandfather, James Campbell. James was a very successful businessman and manufacturer, as well as a political radical – willingly giving his workers an eight-hour day. He served as an alderman on the Brisbane Municipal Council and was an unofficial spokesman for migrants, particularly Scots. J. D. Campbell and his family lived at Donatello in Riverton Street in the Brisbane suburb of Clayfield. Douglas attended the Brisbane Central School, and then the Technical College. When Douglas enlisted in Brisbane on 19 January 1915 he was placed with reinforcements for the 2nd Light Horse Regiment. He was aged 22, his occupation stockman, his religion Presbyterian, and he was 181.6cms tall, weighed 76.2kg, and had blue eyes, brown hair and a fair complexion. Douglas embarked in Brisbane on the HMAT Itria A53 on 9 February 1915, and was taken on strength with the 1st Light Horse Training Regiment in Egypt on 28 April 1915. He arrived on Gallipoli on 9 July 1915, when the 2nd Light Horse Regiment was holding Pope’s Hill. However, on 18 July he was hospitalised with appendicitis, and taken first to Malta, then Hampstead Military Hospital in England and then in October 1915 to Harefield Park (No.1 Australian Auxiliary Hospital). It was not until 10 June 1916 that Douglas was able to return to the 2nd Light Horse, who were by then at Romani. In the ensuing period the 2nd conducted a number of lengthy, exhausting patrols into the Sinai. Douglas was hospitalised for a week in late July – the records don’t reveal the cause. As outlined earlier, just before dusk on 3 August 1916 the 2nd was deployed, and Douglas fell in the fighting in the early hours of the next day. 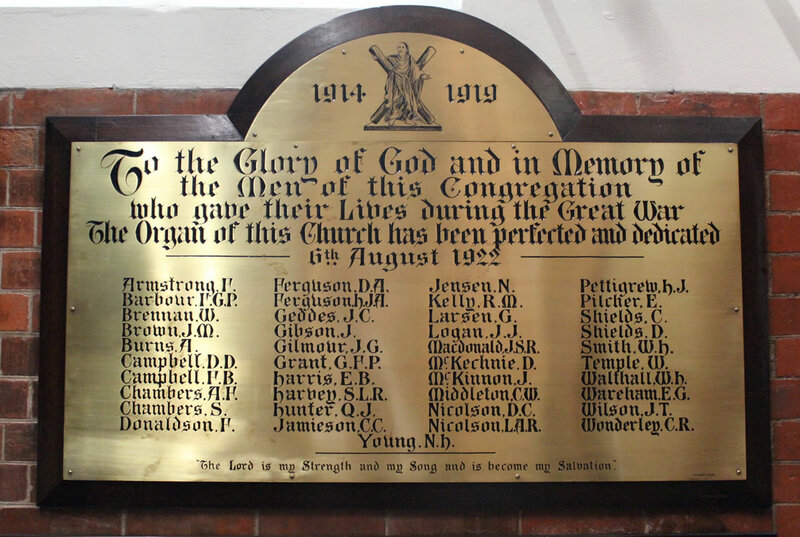 In the evening of 20 August 1916 an in memoriam service for Douglas filled Scots Presbyterian Church in Clayfield. Douglas’ mother – who found dealing with correspondence about Douglas and his grave distressing if not impossible to deal with - was on the communion roll at Saint Andrew’s Church (on the corner of Ann and Creek Streets) in the city. 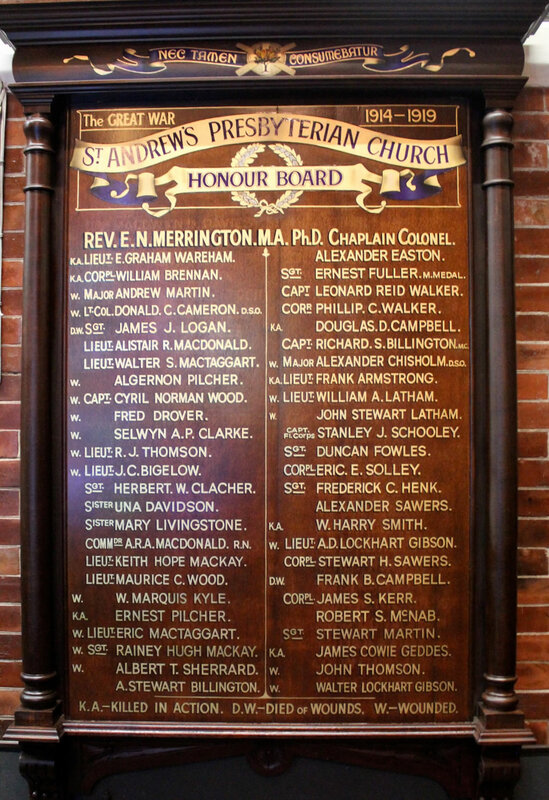 In that Church Douglas was listed on both an Honour Board and on a brass plaque for those who made the ultimate sacrifice. His first cousin, Frank Banister Campbell, who died in May 1917 is the subject of a separate webpage entry, and is similarly listed on the honour boards. • Cambridge University Press 2009. • Australian Imperial Force, August 1914-April 1919 Swanbourne WA, 1994. • Campbell, AB and MB The James Campbell Story Brisbane 1990. • Gullett, HS ‘The Australian Imperial Force in Sinai and Palestine, 1914-1918’, Vol VII, Official History of Australia in the War of 1914-1918 10th edition 1941. • Dictionary of Biography, National Centre of Biography, Australian National University, Volume 7, Melbourne 1979. • The Brisbane Courier 14 August 1916 p4. • The Telegraph (Brisbane) 19 August 1916 p11. • The Queenslander 11 August 1917 p10.